IMCDb.org: 1956 Cadillac Sedan DeVille in "Knockin' on Heaven's Door, 1997"
1956 for sure. I can't tell if it's a 2-door or a 4-door, however the "Florentine curve" of the roof where it meets the belt line makes it a "De Ville" as opposed to a "Series 62". It´s a 1956 Sedan de Ville. 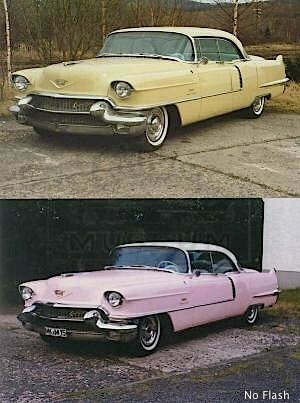 The film company (Mr. Brown Entertainment) wanted a pink one which resembled the 1955 Cadillac that Elvis Presley once gave to his mother. They asked us (= the company I worked for back then) for help, but we could only provide a yellow one for hire at that time. They then asked us to repaint the car in "mountain laurel with white top" at their expenses - and we did. When the film was released in Germany, they also put the Caddy on display at their premiere parties an red carpet events. I also did a couple of wedding rides with this car back then, especially after it had been repainted. It still exists and it still looks the same in 2019. All the hubcaps and other car parts dangling from the gate of the car dealer's lot seen in the main pic also came from our stock. mrcadillac, you obviously know Cadillacs, but, with all due respect, the florentine curve of the C pillar, introduced in 1955, was utilized on every hardtop Cadillac for that year and 1956, from the entry-level Sixty Two series coupe to the flagship Sixty Special and Eldorado Seville coupe. The long wheelbase Seventy Five Series, however, continued to use the same formal roofline of the '54 model.